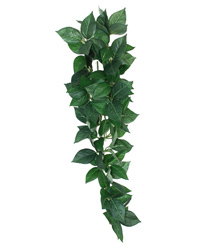 The Sumatra Hanging Vine is an artificial silk hanging vine for creating a realistic reptile habitat. Decorating the habitat is the final action before introducing a new animal. An imaginative display will result in cage enrichment for the occupants and a lifelike picture of nature for the observer. Plastic plants and vines will add a 3rd dimension that provides security and encourages exercise. Use natural cork to increase different textures to the environment. Interior decorating for vivaria is an enjoyable task that definitely develops with practice.